The URL above leads to the result you see in the picture. 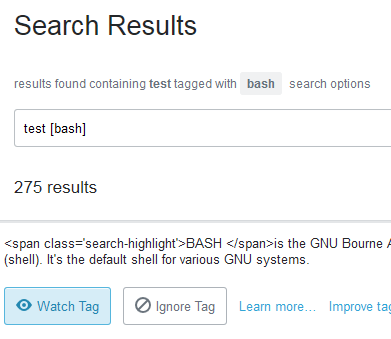 Note the unprocessed HTML <span class='search-highlight'>BASH </span>. Removing the first term from search also removes the error. This paragraph was included to meet quality standards. Not the answer you're looking for? Browse other questions tagged bug status-completed tags user-interface search . Create structs tag? Or burn classes tag?